DUBAI: Saudi Arabia’s goal to eradicate illiteracy has been applauded by international experts and educational bodies, who say the Kingdom is a role model for countries in the Arab world, where more than a quarter of women, men and children are unable to read or write. Earlier this year, Saudi Arabia pledged to raise its literacy rate from 94.4 percent to 100 percent by 2024, and experts say the Kingdom can now play a major part in helping to eradicate illiteracy in the wider region. $1 trillion (SR3.75 trillion) per year. It says that today about 750 million adults worldwide are unable to read or write. 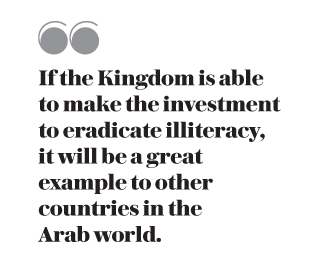 “If the Kingdom is able to make the investment to eradicate illiteracy in their country, it will be a great example to other countries in the Arab world, and worth sharing best practices and the model they used for their success,” Alesha Anderson, senior program officer for ProLiteracy, another advocacy group, told Arab News. Anderson hailed the Kingdom’s efforts to boost literacy rates, especially the country’s projects to tackle adult illiteracy. According to Saudi Arabia’s Ministry of Education (MOE), the current literacy rate was achieved by boosting enrolment in thousands of schools, vocational colleges and universities, with the aim of achieving 100 percent literacy by 2024. Among its many initiatives, the MOE has rolled out adult education centers across the Kingdom, introduced lifelong learning initiatives, neighborhood learning programs, educational and literacy campaigns in remote areas of the country and implemented financially based reward programs to work toward an illiteracy-free society. The government has also granted $51 billion to the education sector in 2018 as part of Vision 2030, its ambitious program to reduce economic dependency on oil sales. Since launching the Adult Education and Literacy System in 1972, and the General Secretariat for Adult Education and Literacy in 1977, the country has seen illiteracy rates fall from 60 percent in 1972 to 5.6 percent in 2018. “Having a 100 percent literacy rate is ambitious, but when a government makes a commitment to address adult literacy issues in their country, we are excited as adults can often be left out of the national education agenda and funding for adult education is often non-existent or very low,” said Anderson. “Yet research suggests that investing in youth and adults (particularly mothers) can directly impact and improve rates for children’s literacy as well. Anderson said Saudi Arabia and the neighboring UAE, which also has several initiatives underway to improve literacy rates, could use their political and geographic influence to lead the way in the adult literacy discourse across the region. Anderson said Middle Eastern countries that have strong economies and are advanced in their development tended to have higher literacy rates. However, there was still a significant need for literacy, especially in the adult population, for many countries in the region. According to Project Literacy, two-thirds of the worldwide illiterate population are women. Furthermore, 123 million 15- to 24-year-olds in the world today cannot read or write. “Female literacy is absolutely important and should be a priority in the Arab region. Access to education for women is still extremely limited, especially in countries that restrict women’s role in society,” Anderson said. Traditionally, Anderson said, barriers to success in national or large-scale literacy campaigns include lack of teacher training, curriculum and support for learners after achieving a certain level of literacy. Despite the social benefits, tackling illiteracy has huge economic advantages. Each year, illiteracy costs a developed nation 2 percent of its GDP, an emerging economy 1.2 percent of its GDP and a developing country 0.5 percent of its GDP, she said. The UN defines illiteracy as “the inability to read and write a simple message in any language.” While Saudi Arabia and the UAE are setting benchmarks to tackle illiteracy, other countries across the Middle East paint a more dire picture, with Afghanistan topping the highest illiteracy rates (72 percent of the population over the age of 15), followed by Pakistan (50 percent), Mauritania (49 percent), Morocco (48 percent) and Yemen (46 percent), according to the Global Campaign for Education. Andrew Kay, CEO and founder of the World Literacy Foundation, said almost 20 percent of the global population was illiterate, while in the Arab region, 27.1 percent of people were unable to read or write. “This means that even these basic educational standards are unmet,” said Kay. “Despite significant progress since the 1980s, the black cloud of illiteracy is still weighing heavily on some Arab countries that are going through a critical phase and facing tremendous political, social and economic challenges. “Saudi Arabia’s literacy rates are much better than other countries in the region, although there are still disadvantaged people that struggle to read. Increased funding and a holistic government approach is a step in the right direction, but we need to ensure the specialist literacy support goes to the people where there is the greatest need. Kay said oil-rich countries such as Saudi Arabia could help its Arab neighbors through “leading by example,” and providing literacy grants, books, tutoring and support. Ahmed said the region was becoming more aware of the importance of literacy and education for all. “For example, Egypt has also come up with ambitious targets in tackling illiteracy by improving educational infrastructure. We expect this trend to continue in the long term as the governments implement their economic transformation programs. The UAE, also, has recently launched a free e-learning platform which provides education videos to over 50 million Arab students. “We believe initiatives such as these, if implemented sustainably, will help the region achieve higher levels of literacy,” he said. Hegazi Idris Ibrahim, a program specialist in basic education and literacy at the regional office for education in Arab states at the UN Educational, Scientific and Cultural Organization (UNESCO), highlighted the Kingdom’s efforts in diversifying its educational programs, paying financial incentives to adult learners who join literacy programs and adopting a “lifelong learning initiative” to achieve an illiteracy-free society. “Literacy is more important than ever given the increasing dependence on fast-growing technology, and the rapid changes in the labor market and inter-country mobilities,” said Ibrahim. “For the region, it is also important for peace and stability.